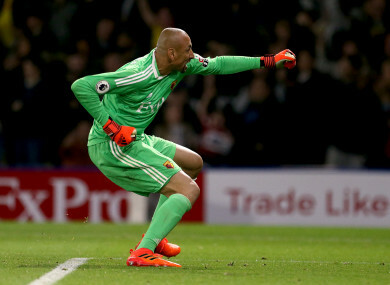 Watford goalkeeper Heurelho Gomes celebrates. ARSENAL’S FOUR-GAME winning run came to a stunning end at Watford as Tom Cleverley’s stoppage-time strike sealed a dramatic 2-1 victory over the Gunners on Saturday. Per Mertesacker’s first Premier League goal in 1,400 days had given Arsene Wenger’s side the platform to maintain their recent surge. But goals from second-half substitute Troy Deeney and midfielder Cleverley earned Marco Silva’s side a victory that moved them above Arsenal and into fourth place in the Premier League table. Arsenal’s first defeat in eight matches in all competitions leaves them nine points behind leaders Manchester City. Wenger had made four changes from the Brighton game before the international break, with Alexis Sanchez the most notable absentee. The forward’s 15,000-mile round trip to South America ended in disappointment as Chile unexpectedly failed to qualify for the World Cup finals and he wasn’t even on the bench at Vicarage Road. There was an early alarm for Watford when Richarlison was hurt in a clash with Alex Iwobi, whose studs landed on the Brazilian’s arm. He was able to continue after the application of a bandage and Hector Bellerin did well to stop his burst into the Arsenal box. Alexandre Lacazette did well to give fellow Arsenal forward Danny Welbeck a sight of goal, but Jose Holebas arrived just at the right moment to clear before the England man could get his shot away. It was that sort of game; promising much yet delivering little, until Mertesacker broke the deadlock in the 39th minute. It came from Granit Xhaka’s corner with the massive German outjumping Cleverley and everyone else to head home from six yards and mark his first Premier League start in 18 months with his first goal in that competition since December 2013. The goal improved Arsenal markedly and Xhaka forced Watford goalkeeper Heurelho Gomes into two saves before half-time, either side of a good chance that Bellerin poked wide. Watford looked to Richarlison for second-half inspiration and the Brazilian curled an effort just wide. Miguel Britos’s error allowed Arsenal to launch a swift counter-attack but Christian Kabasele’s sliding challenge on Iwobi in the box ended the danger. Arsenal replaced Welbeck with the fit-again Mesut Ozil on the hour mark and it wasn’t long before Watford made a double switch, with Deeney and Andre Carrillo sent on in search of an equaliser. It was Arsenal who almost scored straight away however, with Ozil setting up Iwobi, who was denied by the fingertips of Gomes. On came Olivier Giroud for fellow Frenchman Lacazette and Gomes again rescued Watford with a save to foil Ozil, whose run behind the home defence perhaps should have been flagged offside. It proved crucial as 32 seconds later Bellerin was adjudged to have bundled Richarlison over in the box at the other end by referee Neil Swarbrick. Up stepped Deeney to level coolly in the 71st minute. Arsenal sought to regain the lead but another promising attack with men over ended when Nacho Monreal delayed his shot and was dispossessed. Mertesacker almost conceded an own goal five minutes from time when substitute Etienne Capoue’s shot bounced off his chest and wide via Petr Cech’s left-hand post. But Arsenal could not survive four minutes of added time, which saw Cleverley smash the ball into the roof of the net on the rebound after Cech had denied Holebas. Email “Late drama sees Arsenal stunned as Watford's fine start to the season continues”. Feedback on “Late drama sees Arsenal stunned as Watford's fine start to the season continues”.